Wireless connection to smart device, manual resistance operation, compact size, easy-to-use, easy-to-read display. 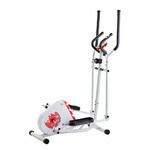 The Elliptical Trainer inSPORTline inCondi ET30m II is a manually controlled elliptical which can be connected to a smart device. 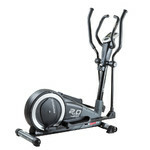 The 4kg flywheel, 8 manually adjustable resistance modes and magnetic brake mechanism allow for a smooth and quiet running while the 29kg stable structure, anti-slip pedals and soft handles allow for a comfortable and safe workout. 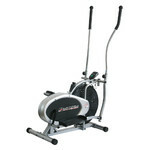 The 30cm stride length and compact size make the Elliptical Trainer inSPORTline inCondi ET30m II suitable for smaller users and rooms. You may also appreciate the water bottle holder, tablet holder, uneven floor adjustment system and transportation wheels. The control is intuitive – using a single button, you can switch between the speed, distance, exercise time, odometer, calories burned and heart rate indicators. Moreover, you can also turn on the “Scan” function, which switches between the indicators automatically. Last but not least, you will get additional functions when you connect the elliptical to a tablet. 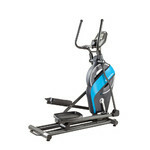 The Elliptical Trainer inSPORTline inCondi ET30m II can be wirelessly connected to a tablet or a smartphone via Bluetooth and the Fit Hi Way app. The app not only allows you to run in the Alps, world’s most famous cities and other interesting places, but also to control the machine from your tablet.